The “something and nothing” weather in the South East of the past week and the uncertainties in the forecast are set to continue for a while. Some met-people call these conditions “unforecast-able”. 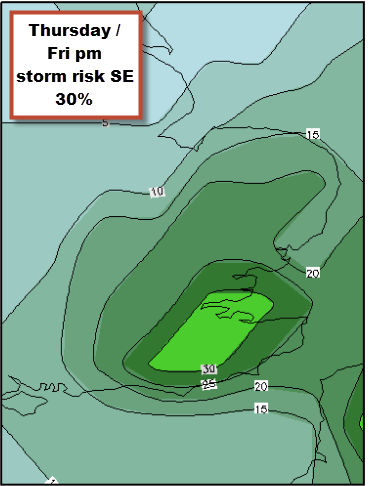 Models seem to be unreliable beyond a few days and even hours. Rainfall has been especially hit and miss to forecast in the SE: predictions have been varying wildly for specific days between torrential, heavy, some and then no rain arrives at all! 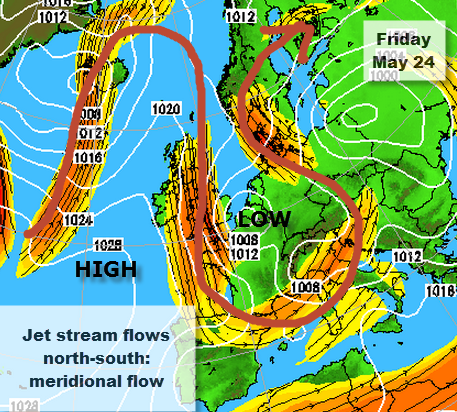 The reason is possibly the lack of the usual “zonal flow” in the jet stream: i.e. west to east flowing jet. The jetstream is meandering north-south and weather systems are more or less STATIC: the UK has been stuck in a low pressure trough for over a week. The normal procession of low pressure systems (depressions) and brief sunny HIGH pressure ridges seems a distant memory: it simply hasn’t been a feature of our weather for ages. Forecast models seem to struggle with this. The overall synoptic weather situation remains the same. That is: a big blocking HIGH over the Atlantic and very weak westerlies with the jetstream in a North-South pattern (meridional) bringing down cool northerly winds direct from the Arctic which “pool-up” across Northern France and Southern UK creating a LOW pressure trough. LOW pressure in Spring with a stronger sun can mean pleasant warm sunny spells but showers: it is the showers which, fortunately, have barely troubled Reigate. However, (and this does look more certain! ), a significant little LOW is set to spiral down the N Sea Thursday – Friday, deepen along the way and strengthen Northerly winds and bring rain, especially to the SE: some frontal rain and showers are predicted to accompany this LOW but again – it could be rather hit and miss depending on how close the LOW gets to the SE England and the strength of accompanying fronts. Meanwhile, sincere sympathy and thoughts to those caught by the terrible EF5 tornado which caused such terrible damage in Moore, Oklahoma yesterday. Following events on Twitter and news reports on destroyed schools was very sad and upsetting indeed. The tension between following exciting weather and the potential for witnessing terrible disasters unfold in front of their eyes was palpable for the storm chasers and met-enthusiasts involved. Unfortunately, the weather in MidWest continues to threaten areas with tornadic conditions: lately in New York state too. Take care out there. Our UK weather is usually mercifully benign in comparison.